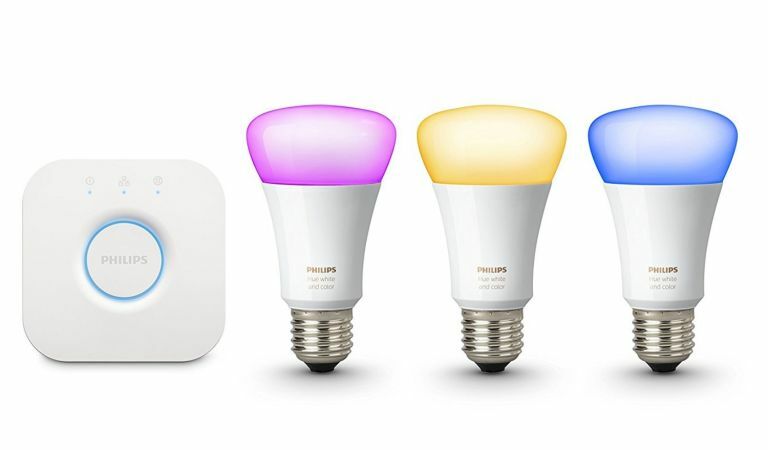 Philips Hue is a solid choice when it comes to kitting out your smart home with smart lighting, and these starter kits are the perfect introduction: you get a Hue Bridge 2.0 for connecting the lights to your router, and a selection of bulbs, too. The Hue Bridge is all-important, letting you control your bulbs from your phone as well as the likes of Google Home and Amazon Echo smart speakers (rather than just being able to turn them on or off like any other bulb). All you need to work out then is: a) do you want colour or white-only bulbs? b) what bulb fitting do you you want: bayonet (UK only), screw or spotlight? The attached pictures are usually good guides, but if you're buying from a quality retailer you'll get the exact bulb IDs, too. Bayonets (UK only) are B22, medium-sized screw-ins are E27 (in the UK) or A19 (in the US) and spotlight are GU10. So, if your lighting fixtures at home take those same bulbs you should be fine with the corresponding Philips Hue starter kits. Once you're sorted with a starter kit, check out the other Hue items in the range with our Philips Hue deals page. This is our top recommendation if you're looking to get started with Philips Hue, as it gives you three Richer Colour bulbs and the base station all in one package. With this set you can really kit your home out for parties or just freshen up the ambiance in a room, and it provides a good platform you can add to with more bulbs later on. Don't forget to check out the range of Philips Hue apps to find new colour scheme 'recipes' – there's even an app for laptops that attempts to mimic on-screen lighting with your smart bulbs. The prices below are for the medium-sized screw bulbs. In the UK, they're known as E27 bulbs, whereas in the US they're known as Edison or A19 bulbs. Just like the bulbs above, but this time with an old-school British B22 or Bayonet fitting. You'll find these in some other remote parts of the globe, but generally, they're UK only. You're likely to need bayonet bulbs in the UK if you're using slightly older desk or ceiling lamps – most modern fixtures use screw fittings so do make sure you're buying the right one! The final type for now in the Philips Hue White and Colour Ambiance Starter Kit range is the spotlight bulbs, also known as GU10 bulbs. These are the most modern fixtures of the three, and are generally found in kitchen lighting, cabinets, alcoves and new-build bathrooms. Because most kitchens tend to have at least six spotlight bulbs, you can find yourself forking out a serious amount of money filling each slot with a Hue alternative, so getting the cheapest prices out there is even more important. Be sure to check the 'feet' on the pictures as you're shopping to make sure these match the bulbs you have at home before buying. This entry-level Philips Hue White Starter Kit comes with two white bulbs along with the Hue Bridge. This kit may lack colour or 'temperatures' of white but it still includes smart features like dimmer lighting, timers and remote switching (via smart devices). We've listed the best prices for the Philips Hue White Starter Kits in each available bulb type below. Unlike the other Philips Hue Starter Kit deals, most of the White Ambiance sets come with a wireless dimmer switch to use anywhere in your home. This might be on a table with your other remotes, or even as an extra light switch if you stick it on a wall (no wires or drilling required) – so perfect if any of your existing wall switches require a stumble in the dark before finding it. The White Ambiance bulbs are capable of so much more than the standard white bulbs as they can emit differing shades or temperatures of white light and their dimming range is also a lot more impressive than the standard white bulbs. That means you can wind them up to a sharp, bright white light, or chill the scene down with a warmer, natural glow more akin to sunrise/sunset. It's easier on the eyes and a great new way to see your home, and if you're not bothered about multi-coloured bulbs, these are the ones to go for. As it stands at the moment , the Philips Hue White Ambiance Starter Kit is only available with the E29/A19 screw-in bulbs. This set can come with either two or three bulbs.